The moroccan classic khimar, beautiful, with a great coverage. This khimar have a seam in front and is including a triangle underscarf in the same fabric. Abaya is not included in the price. 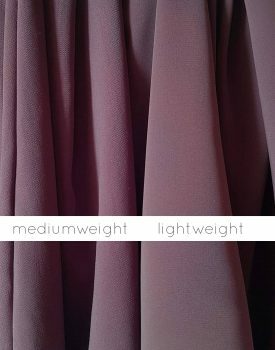 Both the lightweight and mediumweight fabrics are made out of a beautiful, flowy high quality polyester based fabric. The mediumweight fabric thicker and heavier than our original lightweight fabric. For hot weather we recommend lightweight fabrics. Please see the picture below for the difference in texture. Please have in mind that some of the lighter colors in the lightweight fabric might be some what see-through. White lightweight however will always be needed to wear something underneath.